On 30th October BBC Watchdog featured an investigation into Checkatrade.com, the Customer Review website, established in 1998 to allow customers to give reviews about tradespeople that they had used. 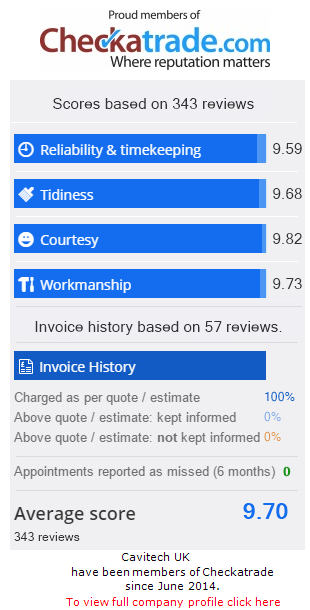 We joined Checkatrade just a few months ago so don’t purport to be experts on the subject, but we have actively used the site as have our customers. To join Checkatrade we went through quite a rigorous interview process. We were personally seen in our offices and had to provide confirmation of our Identity, VAT Status, Registered Address, Company Status, Insurances, various Licences that we hold as well as a requirement for a number of initial good customer reviews. It took a few weeks before we were allowed on board. Just these basic checks alone would eliminate a huge number of cowboys who rarely have a professional setup. The Watchdog report focussed on three customers who had experienced problems. One was a trader not arriving, another was apparently a good plasterer who took on tiling and made an awful job of it and the third managed leave Checkatrade but get back in despite being, by all accounts, a potentially violent fruitcake. Kevin Byrne, Checkatrade’s creator goes into full detail HERE. But was the BBC report justified? Well in some ways it was. There’s no doubt that there were some flaws in the vetting processes that allowed these customers to feel let down, something it seems Mr Byrne has acknowledged in his blog, above. But, as is usually the way with reports of this kind, there was little contextual argument. Checkatrade has 16,000 members, 1.5 million customer reviews online and places around 8000 jobs a day. And remember the sector they work in – building trades. In general people need builders, electricians and plumbers at times of stress, when things aren’t working properly. Strangers must then be allowed into the home to carry out usually messy and intrusive repairs. What is surprising perhaps is that Watchdog seemed only to find three cases – equating to just 0.02% of membership. And what are the alternatives if you don’t already know a trader or have one highly recommended by a friend? These routes would be completely random with little chance of any redress if things went wrong. However, some good has come out of the programme as it has made Checkatrade look at systems and beef up checks which can only be a good thing. But by sowing seeds of doubt, the programme has inadvertently played into the hands of rogue traders who will benefit greatly from the public’s potentially shaken confidence in the system and may now be more likely to risk the lottery approach of choosing a tradesman without any checks whatsoever. I just hope that all of the 16,000 member firms and their satisfied customers get behind Checkatrade to make clear that that vast, vast majority have had a good experience and employ traders with far more confidence the old ‘stick a pin in the Yellow Pages’ alternative. Watchdog would do better spending their time highlighting incompetent traders themselves rather than a free of charge customer scheme that has without doubt driven many of them out of business altogether.